Revised Trail Simulation includes fence on top of barrier. 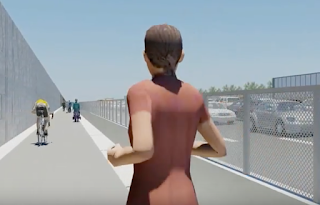 FABB has revised its I-66 parallel trail simulation video to make it more accurate. We strive to always use correct information in our advocacy efforts but sometimes some of the material we need is not available or may be outdated. And, this occurred with our initial I-66 video. The simulations are FABB productions and do not represent many details of the proposed I-66 expansion. The highway is only a rough approximation based on available documents. Our focus, appropriately, is on the multi-use trail. After a helpful meeting with Virginia Department of Transportation (VDOT) officials and the private contractor earlier this week, FABB arranged to make corrections to our I-66 trail user experience simulation. The primary changes are that there will be a fence instead of vanes on top of the concrete barrier separating the trail from the highway. Also, the concrete barrier is now planned to between 32 and 36 inches high rather than just two feet. Finally, FABB wants everyone to know that VDOT is interested in getting public input on the design. They indicated that there will be opportunities other than the meetings this week for this. Final designs will be issued this fall. Please check out the updated video and please speak up at the remaining public meetings. Or send your comments and ideas to VDOT at Transform66@VDOT.Virginia.gov. Check out today's (7/11) article in New York Times Science Times about health risks for bikers riding near big roads.